What kind of prizes would you like to see in the future giveaways? in the future,money is always good. I’d love to see giveaways for more “green” products for the home. I would love to see an iscuba or a kitchenaid mixer. I would like an Amazon.com gift certificate for $200.00 as well. But I guess $200.00 cash, Pay Pal, AMEX gift certificate, etc. will work just about equally well. Paypal cash is good, and anything craft related. Paypal/Visa/cash giveaways are always great, any “green” products, I would LOVE to win a new mattress! I like the paypal giveaways and gift cards to stores like Target. I would like to see more gift cards. I would like to see stereos..
I’d like to see more pet products and beauty products for giveaways. Gift cards are always appreciated along with shoes and clothes! I like kitchen gadgets, Amazon gift cards, and items for kids. As a quiet prepper, I’d love to win a giftcard code from beprepared.com or Emergency Essentials. I enjoy gift card because then I can buy what I want. I like cash or makeup! Cash or amazon gc are always good prizes. A set prize with custom options (color, size etc) — money is nice, but I like it when the blogger gets creative. Gift cards are always great because they allow you to get what you want/need at the time. Also home organization stuff. I love Gift Cards the best! I love gift card giveaways! I like cash or gift card giveaways. They are great! Gift cards – especially for gas! I always like cash and gift cards, personally. Or kitchen appliances! I like useful giveaways: amazon or paypal credits, household cleaners, body care like soap or lotion, food coupons, anything sensible. Gift Cards are always nice. Visa is even better. I’d love to say some trips prizes, and some cash and gift card. Visa gift cards are great! I would like to see more cash or gift cards and also some clothing giveaways. More gift cards or cash! Gift cards are always nice. Exercise equipment – bikes and such. Computers (mine is on its last leg). I would like to see gift cards, or give you the choice between the gift card and the items. I love any GC giveaways! grocery store gift cards are awesome! also,paypal.and starbucks is always a treat! Cell phones or other consumer electronics. I like make-up and beauty giveaways. I think an iPad mini would be awesome! Cash and gift cards are the best! Thanks so much! I love to see cash or gift cards. You can use them for anything. anything electronic…from an electronic toothbrush to ipad to fan to foot massager. Gift cards, home depot or lowes. Amazon,paypal, ebay,new household items! I love to see giveaways for gift cards, internet capable electronics and money always works too, lol! I love giveaways for children perhaps school supplies or clothing! Gift cards are always nice because we get to choose what to spend the prize money on!! Baby stuff and gift cards. Cash and gift cards are always great. A kitchenaid mixer would be fun too! In the future I would like to see more pet or gardening contest. Thank you for all the past great contest and reviews. I would like to see more small appliances, kitchen related items, organizing items, and gift cards are always great. Love the gift cards! Maybe a Disney Dooney? Gift cards are always fun. Kids things are fun. Cash. Would like to see gift cards (Visa, Master Card, and American Express), Amazon gift codes and PayPal. Maybe an iPod Touch or iPod Nano. I would like to see cash, doggie stuff, makeup, and would love for someone to giveaway something similar to the nono. Gift cards and beauty stuff! Gift cards are always great prizes! Cash, gift cards, things for the home. Most things are useful. Thank you to all the sponsors! Amazon.com and paypal gift cards. You never can get enough of these…lol. Thank you and God Bless you. I am honored to get whatever is destined for me to receive however I want to deliver my best of luck to everyone – equally! I’d like to see some different GC’s like iTunes, Applebee’s, Chili’s, and I always LOVE Amazon GC’s. would also love to see more “techy” type gadgets. iPads, iPods, etc. And always, always, YUMMY munchies! Thank you for asking! I love any gift cards to retail stores. We love to eat out so any dining gift card. Gift Cards to retail stores or electronics, video games, video game systems like the Xbox One, PS4 and Wii U, Nintendo 3DS, and Playstation Vita. I love all gift cards! Thank you for asking! I like cash giveaways or prepaid Visas because then I can use the money on whatever I want! Amazon GC or Barnes and Noble.. Kids in College and they come in Handy!! Gift cards are always good! I love gift cards and toys for the kiddos as prizes in giveaways! Gift cards are great! Also anything nice that I would feel guilty buying for myself like nice purses, etc. I love cash, gift cards, makeup, clothes and travel. I think i would like to see maybe another gift card or an ipad mini giveaway. I would like to see some plus size clothing giveaways & would LOVE to see one of the automatic floor cleaner (wet clean) giveaway. Diaper sprayer and the spray guard so you can clip the diaper on and spray to your hearts content without getting water everywhere! Gift cards and cash are great. Shabby Apple is always great! I’d like to see green products and handmade products. Gift cards ! Then people can buy what they need 🙂 Thanks so much ! Paypal, Visa cards and cash are best. Then the recipient can pick what s/he wants. I like “green” stuff and kitchen gear the best! I would like to see all sorts of prizes. You can always do gift cards, as they go over well. I would also like to see though, more organic and green giveaways. gift cards, tablets, computers, electronics in general! or cash! Gift cards are great: amazon, visa, target, walmart or for gas. More gift cards and electronics such as tablets, laptops, ipods/mp3 players, etc…. visa or walmart gift cards, stuff for kids..
Appliances, Gift Cards, Cash, Electronics, Baby Stuff 😀 All sounds great! Gift cards are always great. Especially Visa, Paypal, Target and Disney gift cards. I love gift cards, Amazon, Home Depot, Target, Master Card, AMEX etc. I would love things geared towards children and the kitchen. I would like to see more food prize giveaways. 🙂 Thank you. More cash would be good as there is more freedom in choosing. 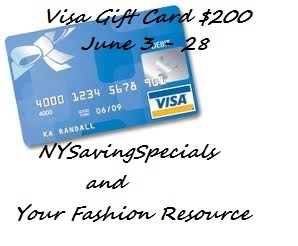 I love gift cards like AMEX, Master Card, Visa – this way we have a choice on spending it. Thank you! I would like to see more Amazon gift card giveways. I love seeing gift cards and electronics! I would like to see more of the kitchen gadgets and gift cards. More VISA gift cards! I live on a low budget, these really help out!!! Amazon, Paypal, Walmart gift cards–and cash always work! PayPal cash or Amazon gift card. I need cloth diapers so I’m going to vote for more cloth diaper giveaways. I’d love to see anything children related.l Baby gear, toys, etc. Amazon gift cards and PayPal cash are always welcomed. I like gift cards and shoe/purse giveaways. I like the Amazon, Visa and Paypal giveaways but I would also like to see giveaways for kitchen appliances (food processors, mixers, slow cookers, juicers, etc.) and other household appliances (vacuums, steam cleaners, air purifiers, etc), home electronics and techno gear (TVs, video game systems, audio equip, and peripherals). I would like to see gift cards. Any free staff is good. Thanks. I love gift cards of all kinds, thanks! Visa card giveaways are my favorite actually, because I can put it towards whatever that my family needs. THANKS! I would like to see more gift card prizes. more just like this. keep it up.